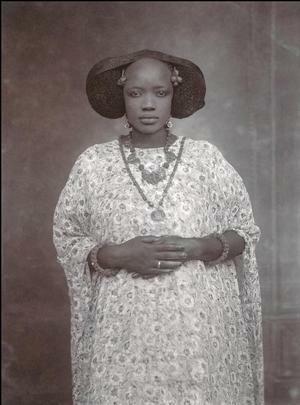 In and Out of the Studio: Photographic Portraits from West Africa (August 31, 2015 - January 3, 2016) at The Metropolitan Museum of Art, NY presents 100 years of portrait photography in West Africa through nearly 80 photographs taken between the 1870s and the 1970s. These works, many of which are being shown for the first time, are drawn from the museum's Visual Resource Archives in the Department of Africa, Oceania, and the Americas, with additions from the Department of Photographs. The exhibition seeks to expand our understanding of West African portrait photographs, by rendering the broad variety of these practices and aesthetics. It juxtaposes photographs, postcards, real photo postcards, and original negatives taken both inside and outside the studio by amateur and professional photographers active from Senegal to Cameroon, and from Mali to Gabon. Among them are renowned artists, such as Seydou Keïta, J. D. Okhai Ojeikere, and Samuel Fosso, and lesser-known practitioners who worked at the beginning of the century, including George A. G. Lutterodt, the Lisk-Carew Brothers, and Alex A. Acolatse. These photographers explored the possibilities of their medium, developing a rich aesthetic vocabulary through revealing self-portraits, staged images against painted backdrops or open landscapes, and casual snapshots of leisurely times. Regardless of their unique place in the history of photography in West Africa—from the formality of the earlier studio poses to the theatricality of Fosso's fantasies—the sitter's self-assured and unabashed presence fully engages the viewer. Drawing upon original research by specialist Giulia Paoletti, the exhibition demonstrates that, contrary to common assumptions, photography in Africa was not the monopoly of Europeans. When photography arrived on the continent, as early as the 1840s, the technology was appropriated by local communities, who adapted the new medium according to preexisting visual codes and traditions of portraiture. By the 1880s, West-African, African-American, and European photographers had traveled along the Atlantic coast and founded temporary and permanent studios catering to the local elite. By the 1920s, significant West African urban centers had a deeply rooted photographic culture: photography had dramatically impacted notions of personhood as well as the ways in which those notions were expressed. From the 1950s to the 1970s, during the transition from the colonial to independence era, photography became a lucrative and flourishing business beyond the main urban centers. The clientele was the ascending middle-class whose taste was nourished by popular magazines and films from Europe, the United States, North Africa, and India. Through these changing conditions of production, patronage, and reception, photography became one of the most prolific and popular media. It allowed artists and patrons alike to express their articulation of what modernity looked like—one that was constantly re-invented. The images that emerged within this global visual economy present Africans as producers, consumers, and patrons of photography. In and Out of the Studio: Photographic Portraits from West Africa is curated by Yaëlle Biro, Associate Curator in the Department of Africa, Oceania, and the Americas at the Metropolitan Museum, together with specialist Dr. Giulia Paoletti, and in collaboration with the Museum's Department of Photographs and Department of Modern and Contemporary Art. Art from and about the African continent is well represented this fall season in NYC with related exhibitions at the Met here and here; as well as the Zanele Muholi exhibition of photographs at The Brooklyn Museum of Art, here; The Walther Collection focus on contemporary African photography here; and Teju Cole's survey of 20th century West African photographic studio work in the NY Times Magazine summer, 2015, here.